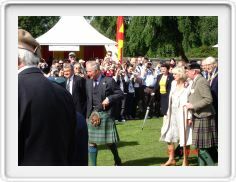 Jean Moffat waiting in line with the other Chiefs to meet Prince Charles and Camilla. 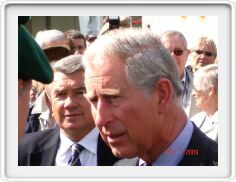 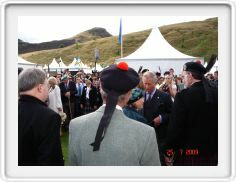 Prince Charles, Duke of Rothesay meeting Chiefs. 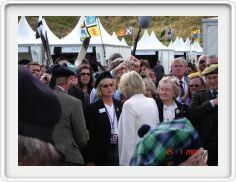 Jean Moffat on other side just behind Camilla. 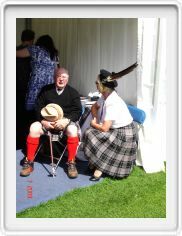 Jean talking to John Moffat in the Moffat tent at "The Gathering". 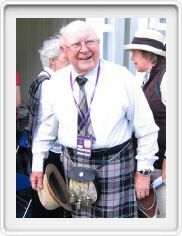 John is now 90 years old. 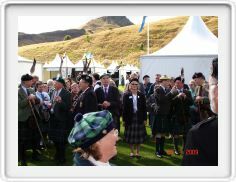 Adam Moffat and Robin Gates. 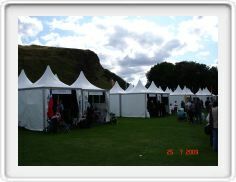 A view of some of the Clan tents on the grounds of Holyrood Palace. 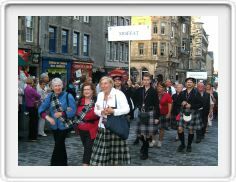 The Moffat Section of the parade up the Royal Mile from Holyrood Palace to Edinburgh Castle. 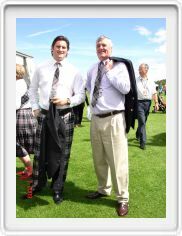 (This image supplied by Bill Covington of Clan MacVicar).